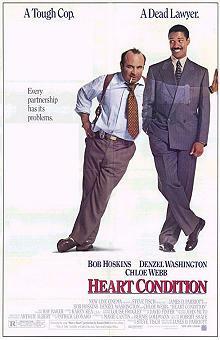 Jack Moony (Bob Hoskins) was a cop who thought he had a problem with black people. That was before he was given the heart of a cocky black lawyer (Denzel Washington). Now the two of them are linked until they can find the donor's killer. It's a great shame that the concept behind this story -- racial prejudice -- still exists, but the film Heart Condition is the good coming from the bad. A clever and humourous story of two men who need to work together despite their inherent dislike for one another with the twist that one is a ghost. They discover during their adventure a liking for one another, a grudging respect, and Jack becomes the man he needs to be in order to win the hand of the woman they both love. Every partnership has its problems. A good detective yarn, a well-paced comedy and a touch of romance. Altogether a fun piece of entertainment.